Ben Grasso, Picture Picture, 2013, oil on canvas, 50 x 70". Nearly all of Ben Grasso’s paintings on view in his latest solo exhibition reveal a kinetic, transitive world of architecture on the move—a status underscored by titles like Renovation I, Renovation II, Adaptation, and Rebuilding a Lost Civilization, (all 2012). The building in this last image floats in a vaguely axonometric space, at once coming undone and revealing how it might be put together. Here, several of thirteen paintings recall computer modeling or assembly diagrams. These are not, however, mere technical exercises. The irony of an unlikely midair suspension is tempered with the artist’s emphasis of his own brushwork. Grasso makes plain his paint’s application—whether rendering wooden beams or errant foliage—such that the works come alive in their own formal gymnastics, as much as that of their structural subjects. Expressly trembling strokes seem aptly matched to the splintering of wood and the striation of leaves. The light that illuminates the side of the house in Rebuilding a Lost Civilization grounds the scene in time even as it is lifted out of humdrum space. Bringing the viewer indoors, meanwhile, Picture, Picture, 2013, offers up an unsettling absence. 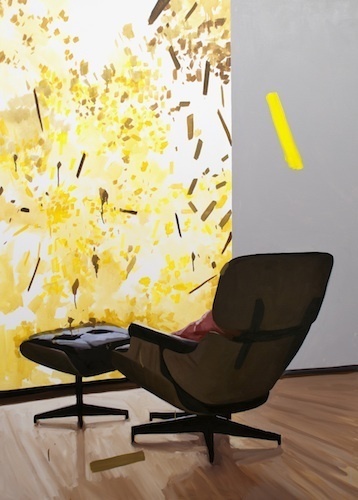 Grasso depicts the back of an Eames chair and stool, the top of which appears invaded by the hanging abstract painting that it abuts. The play here between fictive spaces—a cozy interior and the framed abstraction that adorns it—is just that: playful, nuanced, begging a second look. A single diagonal stroke floating in the canvas’s right quadrant strikes—in its lone, discreet errancy—an arresting note. Conjuring something of an Eric Fischl painting abandoned by its late-modern, disaffected denizens, Grasso’s work truly holds its own here.